This vacation has been so packed with fun that my head is swimming. Or is that the heat and humidity that is making my brain fuzzy? While in Vermont, and while the tent was going up and my-sister-in-law baked 19 wedding cakes (or was it 13? ), I got some more stamps on my National Parks Passport. 35 minutes south of my brother Tom’s house, I toured the Saint-Gauden National Historic Site. S-G was a talented sculptor who specialized in bronze-casted, life-sized statues of important people like Abe Lincoln. The NHS was his home and gardens. More fun was driving through the covered bridge each way. Ramsey is 9’3″ tall, the limit, so I stayed in the middle of the bridge. A local I met later at an ice cream stand told me this bridge is the longest covered bridge in North America. By the following day, my other brother, Charlie, and his wife Paula had joined the menagerie. They accompanied me in visiting the much more lively Marsh-Billings-Rockefeller National Historic Park. The site includes a working dairy farm — all gold-colored Jersey cows. The best part is the nursery for the little calves. I took a ton of videos, which I’ll insert in my YouTube summary of this trip. For now, here is another still shot. They had a terrific museum about local farming and a well-done movie about George Perkins Marsh (1801-1882), who first established the estate, Frederick Billings (1823-1890), who bought the estate from Marsh in 1869, and Laurence Rockefeller (1910-2004), who married Billings’ granddaughter Mary French. The men never met each other. The most important thing they had in common is that they were conservationists. The grounds and house are lovely, but not as fun to see as the cows. The wedding of my niece Megan to Tom of NYC (yes, another Tom in the family) went off without a hitch. No rain, a huge blessing since it interfered with the wedding of Megan’s parents, Tom and Marguerite, on the same knoll 32 years ago. A haze blocking the sun kept it from being too hot. After bagels at my brother’s house and goodbyes to Megan and Tom, due to return to Thailand the next day, I headed south. It was Labor Day. I stayed in a charming RV Resort by a stream, where I was able to catch up on my laundry. (Not in the stream.) The highlight of the night was a small bear who lives nearby, raiding their dumpster at night. Apparently, there is no mommy bear anywhere. He spent a lot of time relaxing on a large boulder across the stream from Ramsey, but not that far. He watched me with lonely eyes and I wished I could feed him but knew better. My task for today, Tuesday, through Friday, is to visit the final 20 monuments on the Henry Knox Trail. I’ll visit five each day, ending in Cambridge. In general, the trail follows Route 20 as it crosses Massachusetts from West Springfield. Today I first found West Springfield’s monument. Then Springfield’s. The monument is in front of the National Armory NHS (also started by Henry Knox), so I toured that, too, and got another stamp on my passport. After finding each monument, I took a photo of it, then drove to the local library and donated a copy of Henry’s Big Kaboom to the children’s department. The Most Charming Library of the Day Award goes to the Warren Library. I had written ahead to the libraries, so they expected me. Palmer (today) and Northborough (Thursday) asked me to perform with my ukulele. I like doing that. My goal is to educate the towns along the route so that in 2026 when the Train of Artillery is reenacted to celebrate our nation’s 250th birthday, the residents will actually know what’s happening. Tonight I am at Wells State Park not far from Brookfield, Mass, where I start up again tomorrow. Too bad I don’t have time to see nearby Sturbridge Village. 15 days from departing Pasadena, California, I drove into gorgeous, Vermont, where my niece is getting married on Sunday. It’s Labor Day weekend. She and her betrothed are here at her parents from their own home in Thailand. The family is gathering from all over. I traveled through 16 states to get here. I toured 8 National Parks, 4 National Historic Parks, 4 National Monuments (5, if you count Scott’s Bluff, which I saw from a distance), 1 National River and Recreation Area, 1 National Historic Site, 1 National Heritage Corridor, and crossed over 1 National Historic Trail. My National Parks Passport has all sorts of cancellation stamps in it. I spent 4 nights in RV parks, 5 nights in state parks, 1 free night in a rest area, 1 free night boondocking on public land, and 3 nights parked in front of relative’s homes. I stopped for gas 29 times. The most I spent for gas was $3.49/gal in Bryce Canyon NP, and the least was $2.69/gal in Minnesota. My favorite campground was Fort Robinson in Nebraska, and my favorite food was the beef with barley soup I bought take-out from their restaurant. Best of all, I’ve made 4 new fellow-RVer friends! Since my last post, and before leaving Buffalo, I stopped briefly in the Theodore Roosevelt Inaugural National Historic Site. It was the home of Ansley and Mary (Grace) Wilcox on September 14, 1901, where Teddy Roosevelt was staying when he learned that President William McKinley had died. McKinley had been shot by an assassin in Buffalo eight days earlier on September 6. Teddy was sworn in as the new president in the library of the house (now part of HIS National Parks) four hours after McKinley’s death. Annie was waiting in the car, so I took a quick look around, collected the brochure, and stamped my passport. About an hour and a half hour northeast, I reached the Women’s Rights National Historic Park in Seneca Falls, which is also along the route of the Erie Canalway National Heritage Corridor. As it states on the placard, this is the only National Park dedicated to a movement. I was allowed to take Annie with me on the walk around Elizabeth Candy Stanton’s home. We peeked in the windows. And we walked to the Seneca River below, which was, in Stanton’s day, part of the canal system. Dogs are not allowed in the National Parks Visitor Centers, so with the car still running and air conditioner blasting, I dashed into the center to stamp my passport, collect the National Park brochure, and snap this photo of a tour going on that I had to miss. You can barely see the ranger guide behind the suffragettes. I drove through the next town over from Senaca Falls, Waterloo, to see (through the van window) the homes of Mary Ann M’Clintock and Jane Hunt. Annie wasn’t welcome in the Waterloo Memorial Day Museum either, so we skipped that in favor of a chocolate mint ice cream cone. Then traveling I-90, which follows the Erie Canal as it heads to Albany from Buffalo, we headed to Fort Stanwix National Monument. The fort used to guard the stretch of land between Lake Ontario and the Hudson River, waterways important from the earliest fur trading days, and even before by the American Indians. Traders used to carry their canoes and other boats from the lake to the river, hence the land was considered a portage. Eventually the city of Rome, New York, grew around and over the fort. Like its namesake, all roads led to Rome, and it was the center of the Empire (State). 110 miles due east, I arrived at Saratoga National Historic Park on the corridor of the Hudson River. I had driven past it last June when I followed the Henry Knox Trail. Henry’s Train of Artillery passed by Bevis Heights, where the park is, in December 1776. The Battle of Saratoga, during which Benedict Arnold took a lead role, occurred in September 1777. The park consists of the visitor center and the battlefields. The road through the latter was closed for repair. Missed that. But it was cool enough to leave Annie in the van so I could watch the movie about the battles and see the exhibits in the visitor center. A five-year-old boy overheard me ask one of the rangers if many visitors to the park were also following the Henry Knox Trail. The boy ran to his parents who then informed me that the lad was a huge fan of Henry Knox. The family was indeed in the middle of following the Henry Knox Trail (even using the same guide I used in June from the Hudson Valley Foundation), had visited the Henry Knox Museum in Thomaston Maine, and bought my book. The young boy has been driving his parents crazy with the Kaboom chorus just as my four-year-old grandson has been driving his parents crazy. How fun to have a fan! I gave a copy of Henry’s Big Kaboom to Saratoga NHP. Who knows? Maybe they will add it to their bookstore. Here is the view of the battlefield. Beyond that is the Hudson River, and beyond that are the Green Mountains. I made it to my brother’s in Vermont in time to interrupt dinner with the in-laws-to-be. I parked Ramsey across the street on the lawn of an abandoned house, made myself a bean and cheese quesadilla, and opened my last Corona. What a great trip it has been had so far. It is stormy and green here in the cheese state, but gorgeous. Since my last post, I spent a peaceful night by the lake at Split Rock Creek State Campground just east of the Minnesota border – the best site for a night in Ramsey ever. About 15 minutes up the road, I toured Pipestone National Monument, where American Indians have mined the red stone used for peace pipes for as long as their oral tradition remembers. The red stone is thought to contain the blood of their ancestors, hence a very spiritual stone. This reproduction of a painting by George Caitlin shows the mines in the middle of the prairie in the mid 1800s. Then I dashed through corn field after corn field to St Paul on the other side of Minnesota to visit my third-cousin-once-removed, Leila. She turns 94 this Thursday. I spent two nights in a real bed. On Saturday, we toured Grand Hill, where her side of our family lived for four generations, and where my paternal grandmother spent her childhood. The current owner of 501 Grand let us look around. This morning, more of my third cousins gathered for breakfast. Here are four generations of Ameses. Next destination, Cuyahoga Valley National Park in Ohio. I must drive through Illinois and Indiana first. I’m due in Vermont for the wedding festivities for my niece on Friday. I’m on the 10th day of my 6-wk Swing Around the USA, which I should probably rename “Zoom Around the USA.” On travel days, I’m driving between 215 and 297 miles a day, not counting the first leg from Pasadena to Zion, which was 433 miles. I’m paying between $2.77 and $3.59/gal for gas depending on how remote I am. I thought I would boondock more, but so far I’ve had only one free night. The free view over the Grand Staircase Escalante National Monument was amazing, but I wasn’t very comfortable with the isolation. Feeling less brave, I look first for state park campgrounds, which are gorgeous and inexpensive ($12 to $24 so far), then RV Parks ($33 to $45). I’ve only had to dump my tanks once. I prefer my own coffee to anything I can buy out and eat lots of fruit and granola for breakfast. In order to eat plenty of veggies, I cook most of my dinners. Cooking and eating outdoors is a nice thing to do at the end of a day of driving and sightseeing. Yesterday I started with Wind Cave National Park in South Dakota. It offers two highlights: The “Park” itself is a calming, preserved prairie complete with buffalo and prairie dogs. Under the park, like a subway maze, is one of the world’s most complicated and extensive natural caves. The native Americans thought it was the Source, where buffalo came from. 436 miles have been explored so far by daring people who like crawling through dark, tiny spaces. In the 1800s, all they had were candles to guide them in, and string to lead them out. It’s thought only 20% of the network has been seen so far. Though I overcame my fear of heights to drive the 12000-foot-high trail over Rocky Mountain NP, my even worse claustrophobia and the excuse not to leave Annie in the car too long (there was an hour wait for the Cave tour and the tour itself takes an hour) led me to the 20-minute movie in the visitor center auditorium. To get from Wind Cave NP to Badlands NP, also in South Dakota, I wiggled through the pine-covered Black Hills in Custer State Park. Like every National Park I have seen so far, Badlands offers sights you can’t see anywhere else in the world. The 45-mile drive through the canyons of its white mountains kept me saying “WOW”. At the end of the drive is a campground but off limits to rigs over 18 feet. Ramsey is 20.5 feet. However, not much farther down the road is a tourist spot I’m glad I didn’t miss. The little town of Wall has two RV Resorts. The reviews on the app AllStays, which I frequently use to find places to park, praised Sleepy Hollow RV Resort, which is where we are now. It’s very nice and friendly, and only a short walk away from the real highlight of this town, Walls Drugs, a super touristy mall of shops offering everything from cowboy boots to ice cream to BBQ beef sandwiches to silver decorate rifles. I now have two days to get to St. Paul, Minnesota. My National Parks map says that Pipestone National Monument is about halfway. I made it through the Mohave Desert without melting and toured Zion, Bryce Canyon, Capital Reef, Arches, and Rocky Mountain National Parks with my jaw dropped in awe — snapping photos all the way. I then downloaded the pix to my computer. But none of the gorgeous campgrounds have wifi that allows for me to upload the pix from my computer to this blog, so I’ll recap those days with videos when I get home. Here’s one of Bryce that escaped the download. And this one of Ramsey my second night. I boondocked overlooking the Grand Staircase Escalante National Monument. Boy, was that sunset spectacular! Today I visited Fort Laramie (the covered wagon) and the (in most cases cast copies of) 19-million-year-old bones of Miocene period animals on display at Agate Fossil National Monument in Nebraska, from where the bones were excavated. The drives between each destination have been equally exciting. Even these vast expanses of prairie. Now Ramsey is hooked up at campsite number 67 at Fort Robinson State Park near Crawford Nebraska amidst a gaggle of vintage camper trailers owned by Sisters on the Fly. (12000 women members who meet up for fun events all around the country. Eighty will be here this week. I took a tour of their cute, theme-decorated trailers. Check them out on YouTube if you have never heard of them.) My silver spaceship seems quite plain in comparison. On to Wind Cave and Badlands National Parks tomorrow. I’m due in St Paul MN Friday night. It’s roughly 400 miles from Marin County to Pasadena, a trip I take nearly every month because my daughter and two of my grandsons live there. To pass the time on the boring, straight, Interstate 5, I watch YouTube videos. Yes, it’s safe. The iPhone is propped up at eye level and I watch things that require more listening than looking. I’m addicted to the videos about Tiny Houses. I don’t know why except that I’ve always been interested in architecture, fitting things into small spaces, and living minimally. Not only did I want to see my family before departing on a six-week road trip across the country, but I wanted to deliver to them their dog, Basil (pronounced like the name Basil Rathbone). He had been with me for a couple of months while his family was on vacation. Basil was happy to be home, and I had a great time being Nanna. The LA Zoo is a lot of fun to see through the eyes of a four-year-old. Tomorrow I drive through the tough part, miles and miles of lonely desert. I take the same road east toward Zion National Park that I took a few months ago heading west from Death Valley National Park. The desert has its own beauty, but driving through it can be hot and tedious. YouTube may not be an option if my cell service doesn’t work. BTW. Before I left home, I upgraded my AAA membership to ‘premium,’ just in case Ramsey breaks down far from a service station. As I’ve mentioned in previous posts, one of my goals for purchasing Ramsey was/is to see all the National Parks within the contiguous United States before I turn 76. I reached the goal of visiting all the California NPs within the first year – not counting the Channel Islands, which I had already visited. Nine years to go. 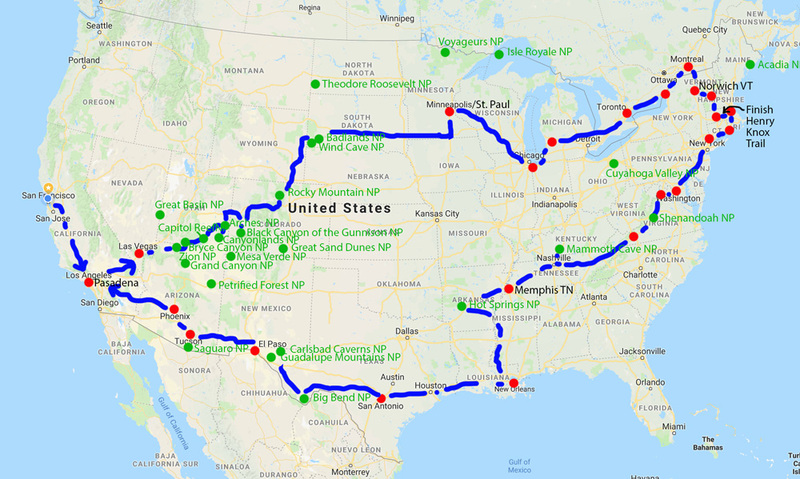 I added the locations of the National Parks to my initial draft of the route for my upcoming swing around the country and made a few alterations. I only have nine days to get from Pasadena to St. Paul, Minnesota. There are a lot of National Parks on the way. Doubt I’ll make it to all of them.